Keep your valuables safe and dry! Men's waterproof billfolds can come in surprisingly handy! He'll be thankful for this functional accessory when he's caught battling nature's harshest elements. Waterproof accessories can come in handy in a number of situations. Whether you're caught in a torrential downpour or hitting the beach, you'll definitely want a waterproof wallet to keep your valuables safe -- and your wallet from being destroyed. While men's waterproof billfolds and wallets aren't necessarily the most common accessories on the market today, they've found increasing popularity amongst men who spend plenty of time outdoors, travel frequently, or simply want to shield their personal materials as well as possible. Ask anyone who's thought twice about leaving his wallet on the beach while he takes a quick dip in the water - this option is almost never favored, even if someone is there to keep a close eye on it! Swimmers, surfers, scuba divers, hikers, travelers and other outdoorsy individuals all understand the importance of keeping their materials dry. A strong, sturdy, waterproof and reliable billfold or wallet will ensure that cash, cards, important papers and other small items are kept safe at all times. Of course, some waterproof wallets are more advanced than others and offer some extra advantages, and not everyone requires the same functions from a wallet. Let's take a closer look at what's available. A quick search for waterproof wallets or billfolds doesn't reveal as wide a selection as one might expect. Still, it's not difficult to find quality products that are functional, waterproof, and even stylish all at once. With a name like Endurance, you can expect some serious results. Mulholland Brothers is one of the few retailers that offers true men's waterproof billfolds. These are constructed of classic, handsome leather, are extremely straightforward and appropriate for everyone from avid outdoorsmen to businessmen. Available in several sizes, the Endurance wallets are constructed of laminated polyvinyl and designed to resist fades, cracks, tears and scratches without fail. The wallets are available in four colors: black, stout, olive and hazel. All wallets serve a purpose, but this one sets its standards so high that it's hard to find anything comparable. The Denko Pakpak Waterproof Wallet is considered a leader in the waterproof accessory world, and it comes as no surprise to learn that virtually anything placed inside this handy wallet will emerge dry as a bone. Its secret is in its unique, innovative construction. Creator Jacques Denko utilized rubber and metal to design a wallet that would easily withstand everything from deep-sea diving to a climb up a snowy mountain. 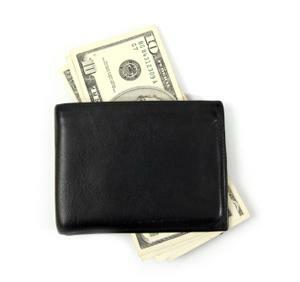 The rubber makes up the wallet's body in a thick, opaque form, while its opening is also constructed of strong rubber and a metal spring that squeezes together. Once the ends of the rubber and metal top are squeezed together, the wallet opens; let go and the wallet easily closes back up. It's not just spectacularly unusual materials that make this wallet so unique. The company claims that the contents inside the case will remain dry up to a water depth of 50 meters. It has also been "torture tested" in numerous trial settings, including a run through a washing machine, a stint in the Kalahari Desert and even an attack by a dog (who could not chew through it even after 15 minutes). This is the ideal choice for the sporty individual who wants something absolutely foolproof and reliable. It's available at Scuba Store. If there's one thing most waterproof wallets have in common besides the obvious, it's their aesthetic. Most are constructed of heavy-gauge materials designed to withstand harsh conditions. Essentially, they allow the wallet to remain practically indestructible in almost any circumstance. The Dry Pak Alligator Wallet is another example of a practical accessory with plenty of style. With its unusual blue alligator print, this vinyl wallet is ideal for use while engaging in water sports or outdoor activities. It features an adjustable lanyard, making it convenient to wear around the neck. Its roomy interior offers enough space for a small cell phone, keys or a pager. Be careful around terms like "water resistant" and "waterproof." The two aren't the same. DB Clay's Tope Version 3 Wallets are an impressive bunch, both for their unexpected designs and their resistance to water. That said, they aren't waterproof. These wallets are constructed of the eco-friendly material called Tope. Similar to vinyl canvas, this material is ultimately stronger, smoother and more reliable than others because of its specialized construction techniques (it lacks the chemicals found in vinyl-based products and is completely vegan). Tope resists water with its non-toxic, raw material finish, yet it is not completely impervious to water. In other words, water can penetrate its surface under the right conditions. The DB Clay collection of wallets is ideal for individuals who prefer style over function, but still appreciate the positive qualities of the material. It's not recommended for extremely active individuals who will be exposed to consistently harsh elements. Whether it's a sign of the times or just another great invention, the Undercover Security Billfold is a traveler's dream wallet. It's spacious enough to accommodate a passport and other similar sized items and it keeps all contents moisture, odor and mildew free and with its urethane coat. This men's waterproof billfold is available online at The Preparedness Center.